Here is the card I made featuring pen work with the Amy Chomas Glitter Gel Pens, Beautiful Quick Quotes products and my Cricut. This is for our new challenge here at CWC. Quick Quotes: Bloody Mary and Mocha Mama Powder Puff Chalk Ink. Quick Quotes: Baby, Kids and Family Itty Bitty Quote Box. 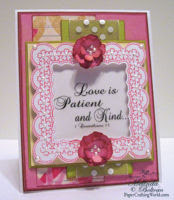 This is the 1 Corinthians Quote on the card. SVG drawing and cutting file for frame. Forever Young Cartridge for the little flowers. Cricut Expression and appropriate software. Be sure to join our challenge HERE!!! You can use your Cricut or other pens for “drawing” OR if you don’t have these available you can use a SUN die cut on your project! Remember to stop back by tomorrow as we announce our winners from last week’s challenge and feature another great project! This is gorgeous Melin! Love the pen work and all your beautiful details! Thanks for the inspiration! This is lovely. Very pretty frame. I have some of the Cri-cut pens and will have to give them a try. Thanks for the inspiration.